Sun Joe SPX3001 Electric Pressure Washer Review - Should You Buy It? 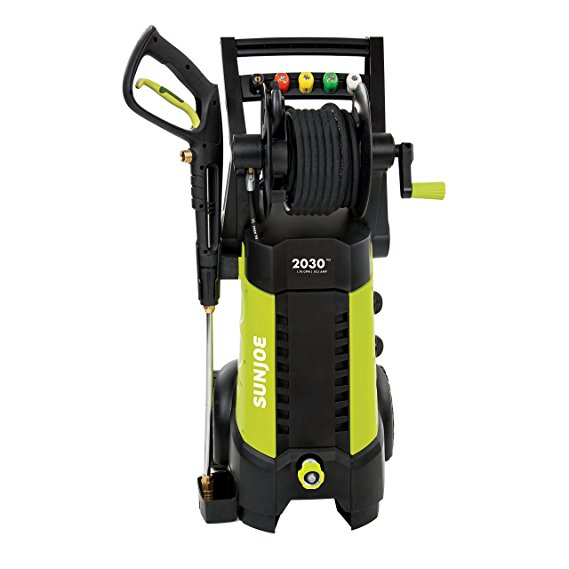 Sun Joe SPX3001 Electric Pressure Washer Review – Should You Buy It? Next one in our list is Sun Joe SPX3001. It is equipped with a very powerful 1800-Watt/14.5-amp motor and can generate up to 2030 PSI of water pressure and 1.76 GPM of water flow and can easily remove grease mark, road tar, splats, stains from surface easily. It is also packed with an onboard extra large 40.6 fl oz detergent tank and is very useful for removing derbis and dirt from cars, vehicles, windows etc. The extension spray wand is 34 inch long and the rear wheels helps in getting a very smooth maneuverability and can reach hard to reach area easily. Comes with Quick-Connect spray tips (0 Degree, 15 Degree, 25 Degree, 40 Degree and Soap). The 20 foot high pressure hose and the 35-foot power cord and an onboard hose reel for easy fast cleaning and storage. It also has a Total Stop System. Overall highly recommended and one of the best electric pressure washer. Powerful 14.5-amp/1800-Watt motor generates up to 2030 PSI/1.76 GPM. Onboard reel keeps 20 ft (6m) high pressure hose. Approved by CSA and 2 Year Warranty. caddy is not very sturdy, especially the handle assembly. power cord due to its length may be coiled up.